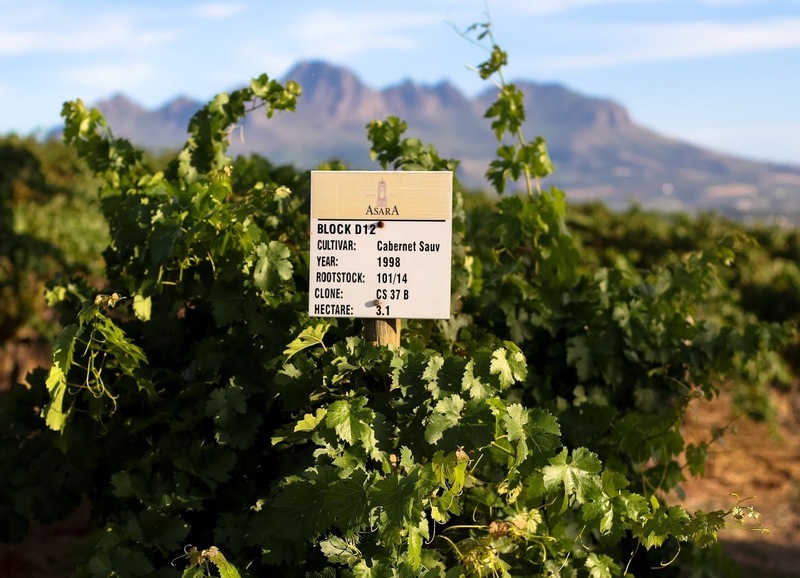 There is history being made in the rolling hills of Polkadraai on the western side of the Stellenbosch Wine Appellation. Asara Wine Estate and Luxury Hotel’s The Asara White Cab 2018 is from the Estate’s Speciality Range and is a 100% Cabernet Sauvignon Blanc de Noir, a white wine made from red grapes. It was towards the end of the last century that the University of California at Davis, a world renowned Viticultural and Oenological campus, using DNA profiling showed Cabernet Sauvignon is a cross between Cabernet Franc and none other than Bordeaux’s Sauvignon Blanc. 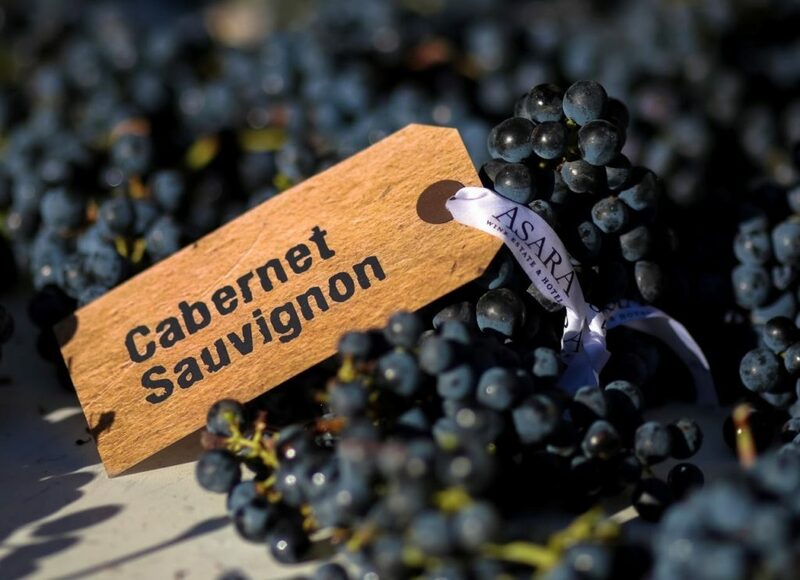 So, no surprise then that the Asara Winemaking Team decided to make an excellent white from Cabernet Sauvignon, the first of its kind in the Winelands. The vineyard from which the grapes come is planted on Tukulu soils known for its water retention properties. The vineyard is at an altitude of 100 metres above sea level. Leaf cover on the canopy keeps the sun from the grapes in the early ripening stages. Five days before harvest Alan Cockcroft and his vineyard team the canopy is thinned out to give some sunlight to the grapes, thus more flavour in the final wine. An even handed 8 tons per hectare was taken off in the early hours of the day at a time when the grapes were showing little colour. After picking the cold chain is maintained as the grapes go into the press in whole bunches for gentle juice extraction. Clear juice is fermented in stainless steel tanks and then left on the lees for 4 months to build flavours particularly in the mid palate. The wine is then prepared for bottling. The Asara White Cab 2018 is bottled under screw cap in a Burgundy shaped bottle. The labeling is wonderfully quirky, a white London on the label and a black and white check strip around the bottom part of the screw cap. In the glass, it is a pale golden straw, gem bright. Ripe white fleshed peaches, pomegranate juice. Juice making entry with a refreshing tail of acidity which runs through to the aftertastes. Ripe melon and naartjie fill the mid palate. As a refresher mid-morning or a sundowner it is excellent. If you are anywhere near the Estate and its Sansibar Bistro, the wood fired pizzas from their oven are a great match for the The Asara White Cab 2018. 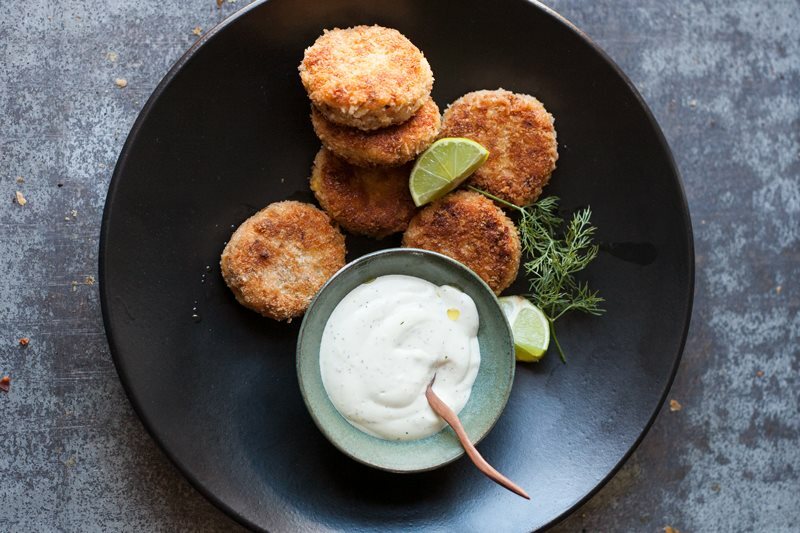 The wine is great for a mid-week supper and Christine Capendale’s Fish Cakes with Yoghurt Sauce, made from smoked trout are a dream and a great match. Her recipe, generously given, is below. 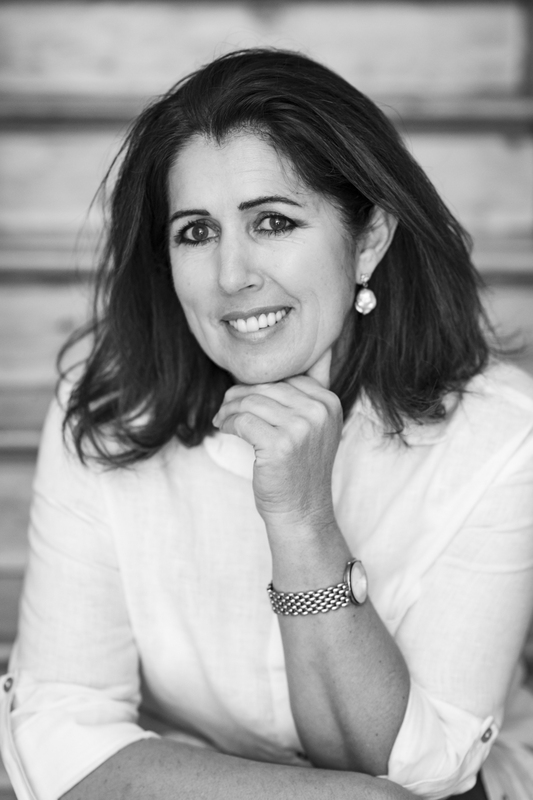 Christine Capendale is a qualified home economist, dietician and cookbook author with more than 20 years’ experience in the catering, speciality cake, and baking industries. Boil the potato in enough water until soft, drain well and mash. Mix together the fish, mashed potato, cooked onion, egg, lime juice and zest, chopped dill and gherkins and season with enough salt and black pepper. Shape small fish cakes and roll into flour, then dip carefully into the beaten egg mixture and lastly in the panko breadcrumbs. Shape them as you go and place on a lined baking tray. Heat enough sunflower oil in a large non-stick frying pan till hot on medium heat and cook the fishcakes on both sides until golden brown and cooked. Serve the fishcakes with the yoghurt sauce.